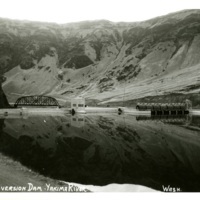 "1 photograph; 9.0 x 13.8 cm. 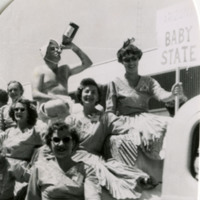 View of several women surrounding a man dressed as a baby on a float; one woman is holding a sign reading "Arizona Baby State," likely as part of the National JC Convention 1955 Parade of States. 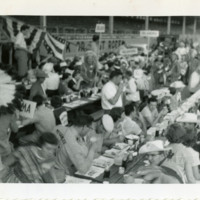 View of several men and women sitting at rows of tables in the Pendleton Roundup Stadium. 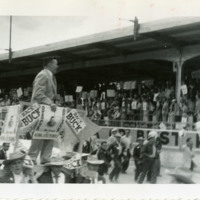 Noted on back of photo, "Richland JC members (foreground) at national JC conf. 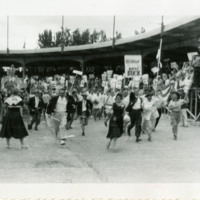 [conference] '55, 704." 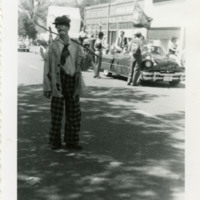 View of a man dressed as a clown walking down a street, likely as part of the National JC Convention 1955 Parade of States. 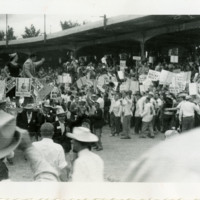 Noted on back of photo, "704." View of two cooks (volunteers?) 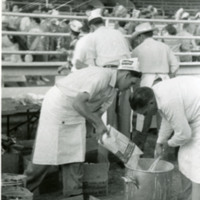 pouring and stirring batter in a large vat in the Pendleton Roundup Stadium. 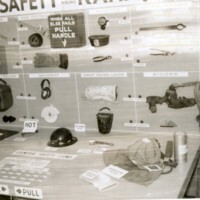 Noted on back of photo, "Prep for pancake breakfast." 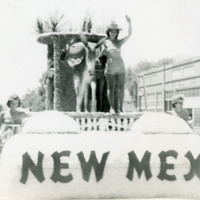 View of a parade float titled "New Mexico", with a donkey and swimsuit-clad woman standing on top; float likely part of the National JC Convention 1955 Parade of States. 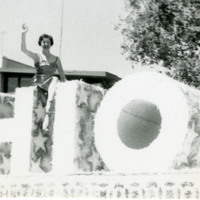 View of a smiling, waving woman sitting on top of the "Ohio" float, likely as part of the National JC Convention 1955 Parade of States. 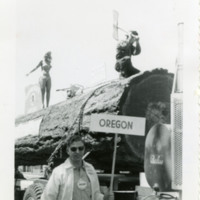 View of an enormous tree trunk float with swimsuit-clad woman and man wielding an ax aboard, and a man carrying an "Oregon" sign alongside; float likely part of the National JC Convention 1955 Parade of States. 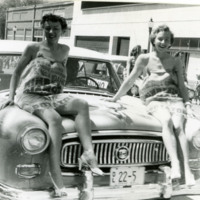 Noted on back of photo, "704." 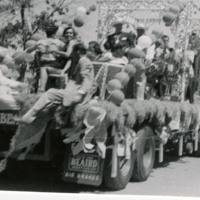 View (looking up) of a waving, swimsuit-clad woman standing on top of the "Oregon" float; float likely part of the National JC Convention 1955 Parade of States. 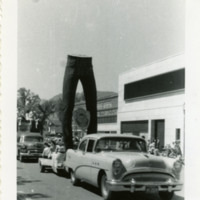 View of a giant pair of pants on a float, likely as part of the National JC Convention 1955 Parade of States. 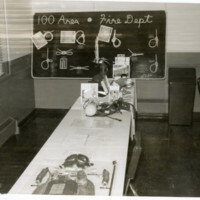 Noted on back of photo, "704." 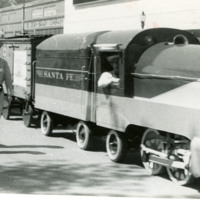 View of the tourist train "Santa Fe" driving in a parade (likely part of the National JC Convention 1955 Parade of States) through a city street, with two men walking alongside. 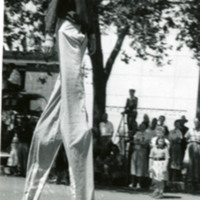 View of a man in stilts walking down the street, likely as part of the National JC Convention 1955 Parade of States. 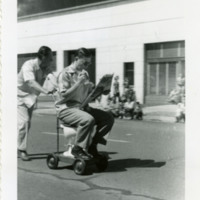 View of a man being pushed on cart while pretending to be on a toilet; "float" likely part of the National JC Convention 1955 Parade of States. 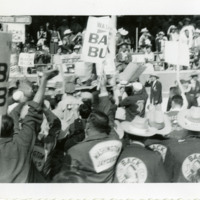 Noted on back of photo, "Bowl bound?, 704." 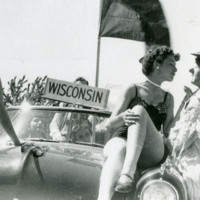 View of a swimsuit-clad, smiling young woman on the "Mountaineers Virginia" float, likely as part of the National JC Convention 1955 Parade of States. 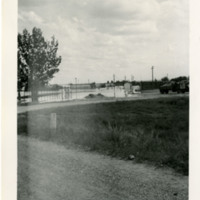 "1 photograph; 10.6 x 8.3 cm. 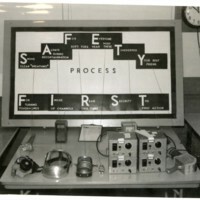 ""Safety First"" process poster board and display with various safety equipment." 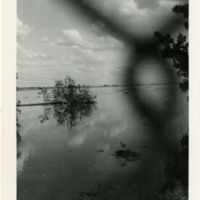 "1 photograph; 20.2 x 25.4 cm. 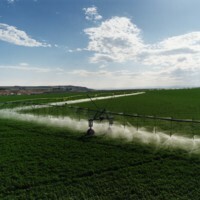 ""Valley"" sprinkler system above ground watering plants." 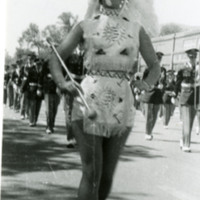 "1 photograph; 20.3 x 25.4 cm. 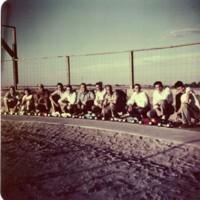 10 men posing for a picture with their model cars." 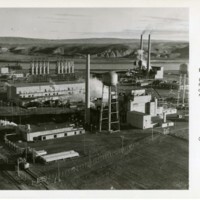 "1 photograph: col.; 5.7 x 5.7 cm. 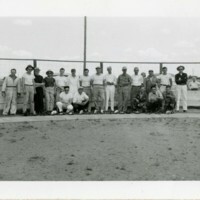 11 men posing for a picture with their model cars plus some." 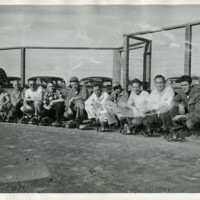 19 men posing for a picture with their model cars." 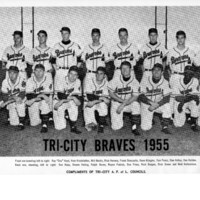 Photo of Tri-City Braves baseball team photo, 1955; 16 players featured and coach, “Ray ‘Doc’ Hoyt”. 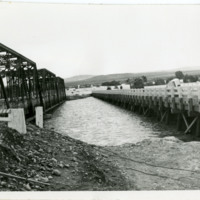 Photo of bridge affected by the 1948 Richland Flood. 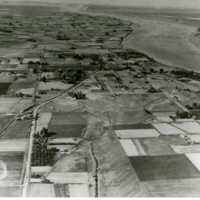 Built up earth in the left foreground, vehicles on the right. Noted on the back, "1 [illegible]." 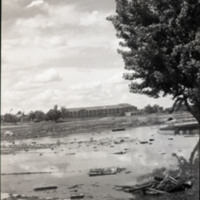 Photo of flooded fence and buildings, truck on the right, tree on the left, road in the foreground. 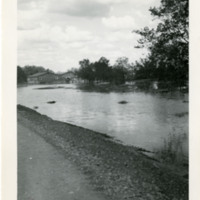 Photo of flood waters next to a road, house in the background, trees on the right. 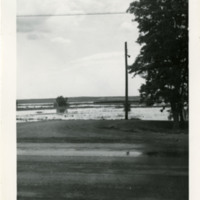 Photo of flooded area, telephone pole in the center, tree on the right, road in the foreground. 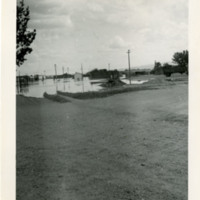 Photo of flooded area with buildings and telephone poles in the background, gravel in the foreground. 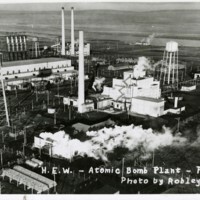 Also visible is a truck on the right, and a pile (debris?) 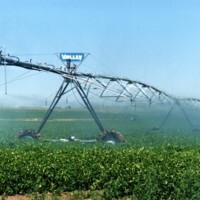 in the center. 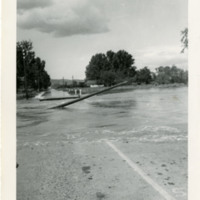 Photo of a flooded road with an overturned telephone pole hanging over the water. 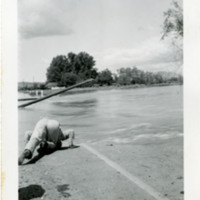 A man is kneeling down in front of the flood waters. 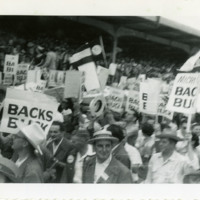 Noted on the back, "B47." 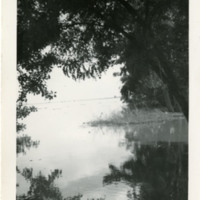 Photo of tree overlooking the water/river (probably flood waters). 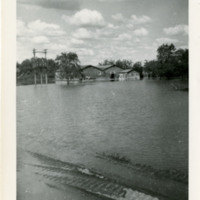 Photo of a house with flood waters in front and telephone poles on the left. 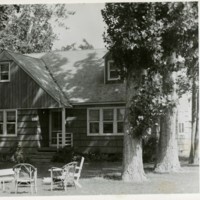 Several trees are visible around the house. 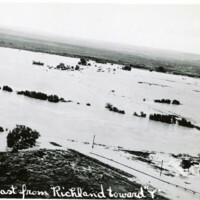 Photo of a flooded road with a telephone pole hanging over the water, line of telephone poles and trees (on the left) following the road in the background. 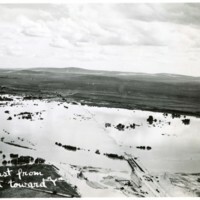 Photo of the flooded Columbia River with the edge of a tree on the right. What looks like a flooded tree is near the center of the photo. 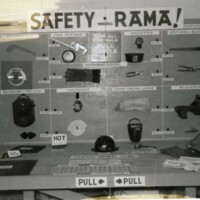 The photo was taken through a chain-link fence.